Old School French at Benoit, Paris | 15,000kms of Food! We were in Paris in September and really wanted to try an old school French bistro so we decided to dine at Benoit, owned by the delightfully charming Alain Ducasse. Wood paneled walls, clean crisp white tablecloths and waiters that are nice but slightly stand offish was exactly the atmosphere I was after. Also, as you can see from the pics below, even the plates had the name of the restaurant printed on them – so French! Something I noticed in France, was when they give you an amuse bouche or complimentary food item to whet your appetite, it’s almost like an entree serve in itself! 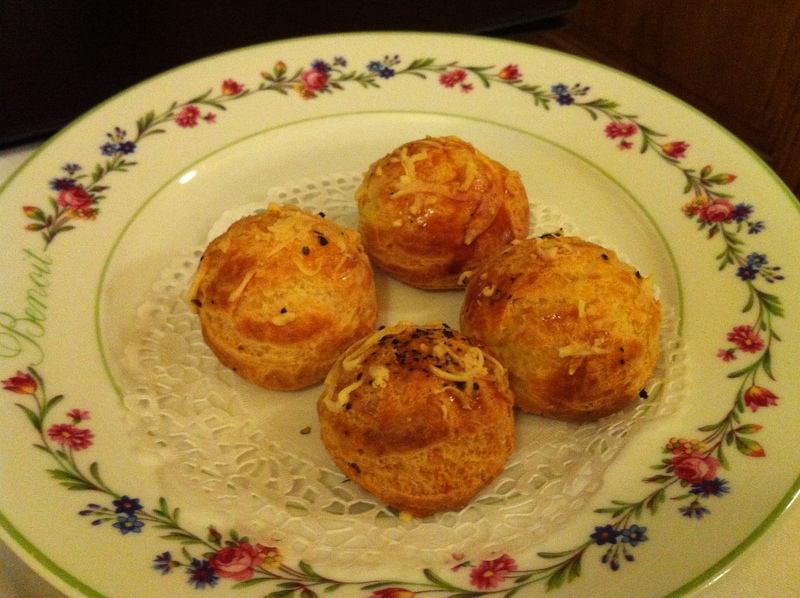 We were presented with fluffy cheese puffs and rabbit rilette with toast. The cheese puffs were light and hollow, but packed a punch and the rilette was delicious (perhaps the best I’d ever had). 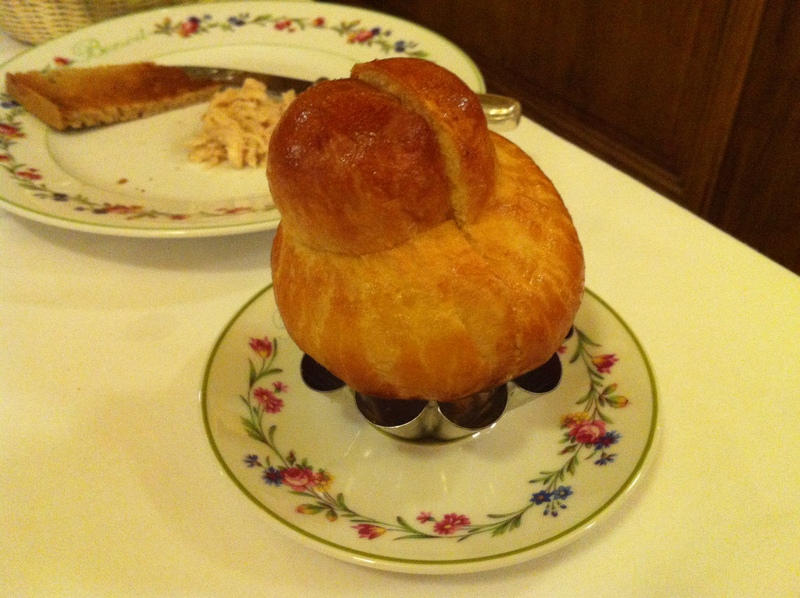 Now, I chose the foie gras as my entree, which came with a toasted brioche. Whilst it tasted good, I was overwhelmed by the two slices that I had. 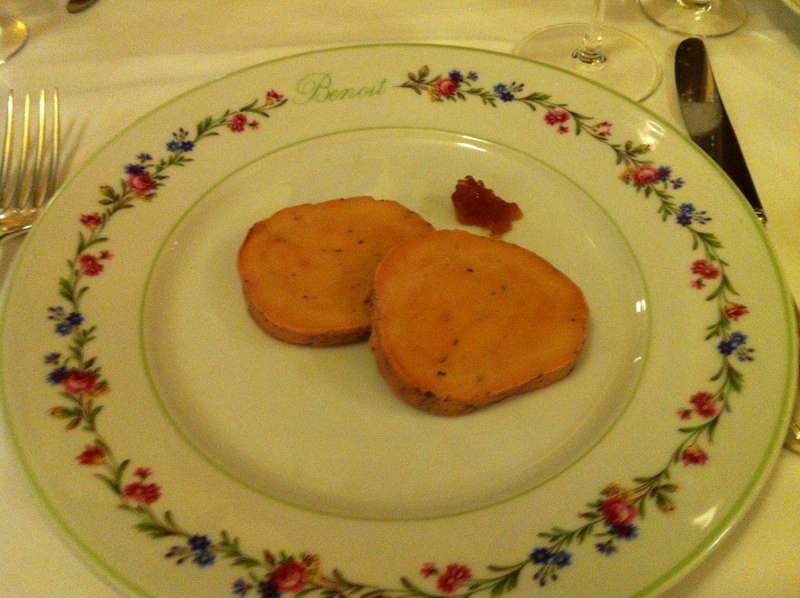 Being from Australia, you rarely get to eat more than 3 mouthfuls of foie gras. I managed to eat one slice, and I felt terrible wasting such a divine piece of food. 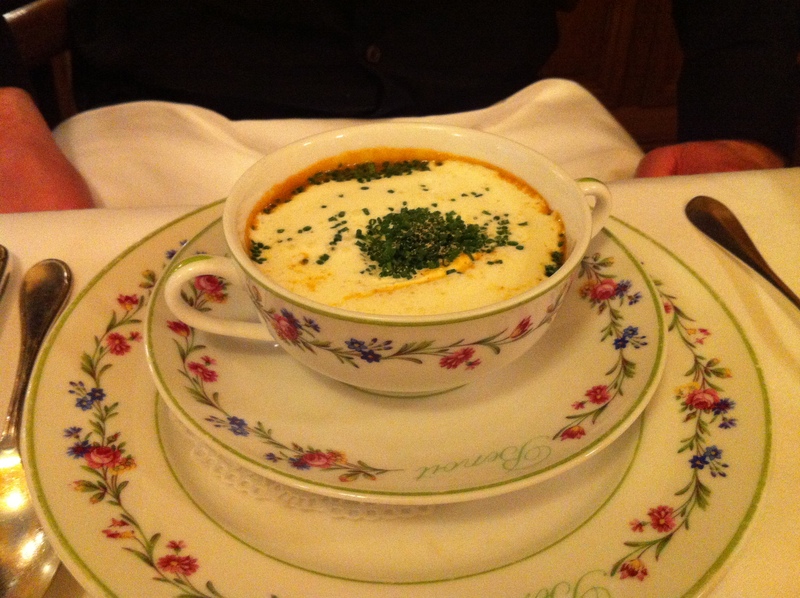 My boyfriend chose the crayfish soup with creamy chives and the mouthful that I sampled was divine! Tasted spectacularly of crayfish (surprise!). 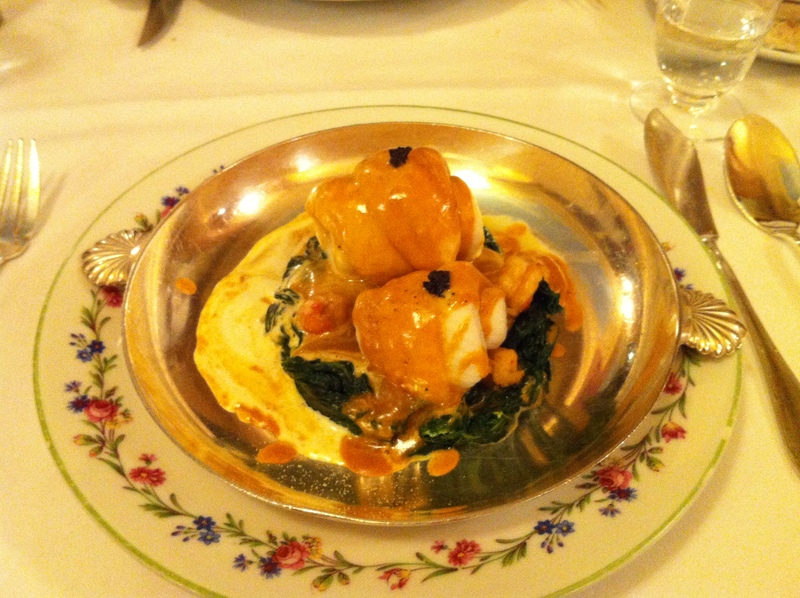 For my main course, I chose sole with wilted spinach. I was watching Masterchef Professionals UK and Michel Roux Jr. stated that this was one of his favorite dishes. Sole is not something you can commonly get in Australia, so I had to give it a go! It was fantastic. The fish was firm and had a light sweet taste to it. The sauce on top was a lobster bisque and the spinach and cream at the bottom was delicious. 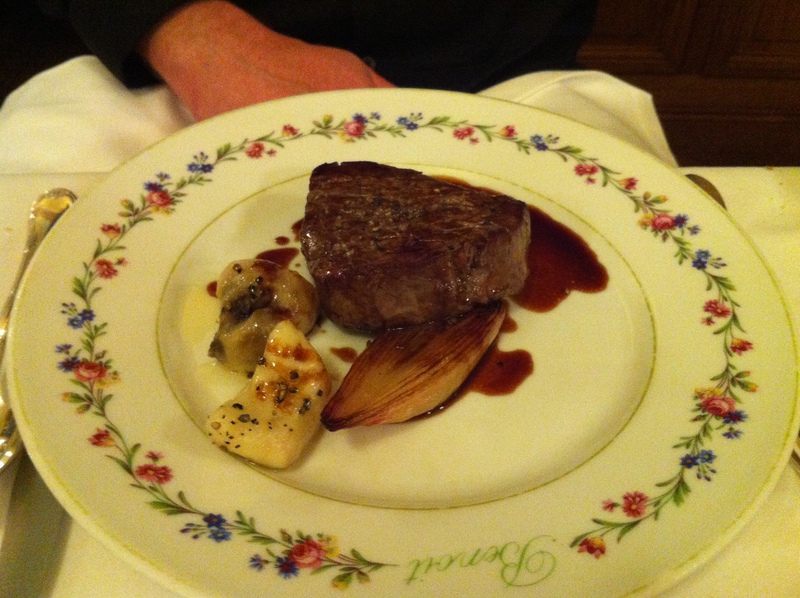 The boyfriend chose the beef fillet with marrow bordelaise sauce served on the side with a macaroni gratin. The steak was cooked perfectly as was the side dish, and the marrow sauce (the star of the show) pulled it all together. 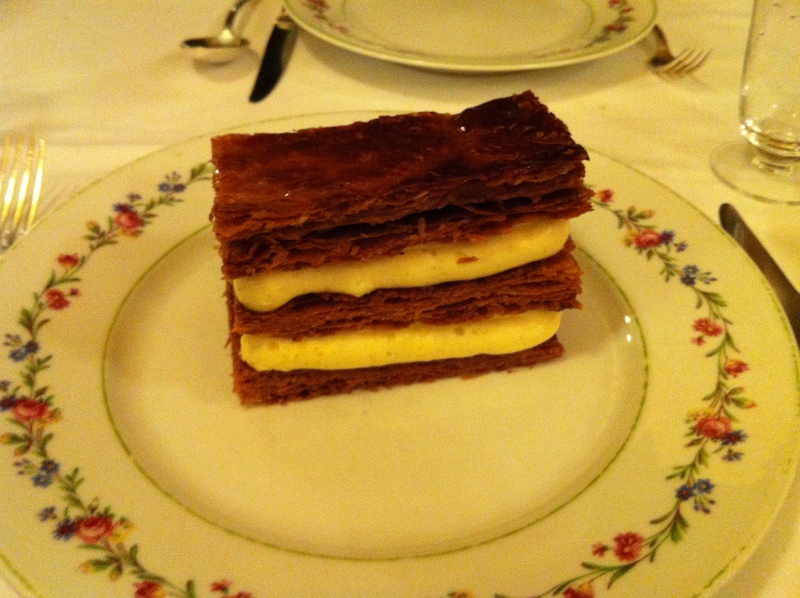 Dessert was the classic vanilla millefeuille, and I have to say, it was the best millefeuille I’ve ever had. The layers were cooked to the point where it was just caramalised and has that burnt butter flavor and the cream inside was thick, rich and creamy. One memorable part of this dinner was that menu’s are not available in English, so listening to the patient waiters translate it over and over again to the non-French was quite amusing. I kept expecting them to throw the towel in and start swearing, but they kept their cool and pushed through. 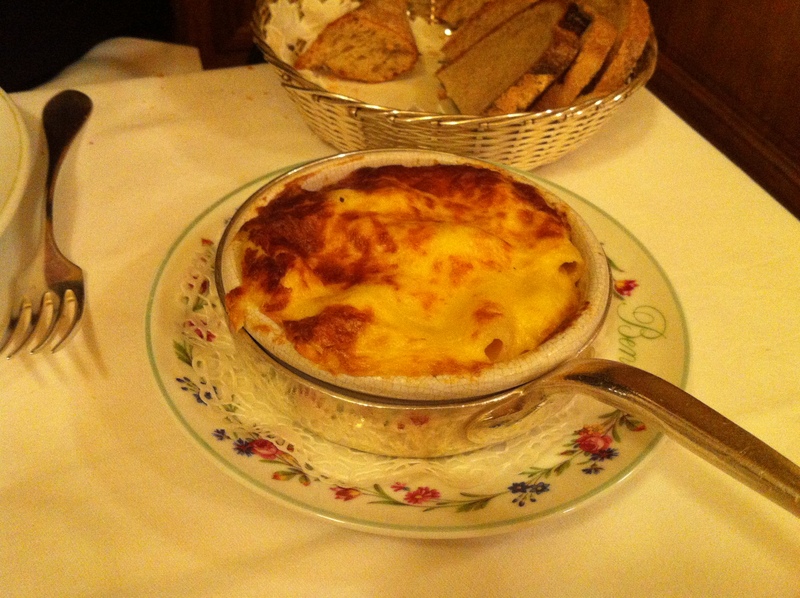 All up, it’s exactly the charming bistro you would expect, complete with great French food. The restaurant was packed on a Wed night. I would definitely recommend it, and I would go again. Omg I am so jealous of the yumy food u ate there! The brioche looks divine and the millefeuille—- yumgasmic!